India has had a thriving textile export trade for thousands of years. 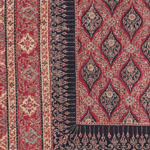 The earliest trade textiles for the Asian market in the collection were made in Gujarat for export to South-east Asia, specifically for trade with eastern Indonesia. Several of these cloths date to 14th and 15th century, with a few as early as the second half of the 13th. century, meaning that they were imported into maritime south east Asia well before the arrival of the European travellers.19 The later cloths were chintz made on the Coromandel coast. The strength of this section is in both quality and quantity. There are at present almost 375 pieces in this category, with new pieces of later dates (18-19th.century) being added as and when found. Trade textiles were an essential commodity of the maritime economy. The textiles were exchanged for spices, sandalwood and forest products. Indian textiles had great importance in the local context, and patolas and block printed cotton cloths survive till toady in eastern Indonesian society. The Indian textiles are typically kept as either as personal belongings of high social prestige, or as lineage owned heirlooms. The indigenous cloths were also greatly influenced by the Indian fabrics and designs. Indian silks had a luxurious appearance, and the cottons were light and durable. But it was in the quality of dyes used in decorating the fabrics that was the main attraction. The brilliance and color fastness of the fabrics was unrivalled in its time. Indian textiles were a major currency of all the trade to the south east Asian islands - to be exchanged for cloves and nutmeg, sandalwood and peppers.